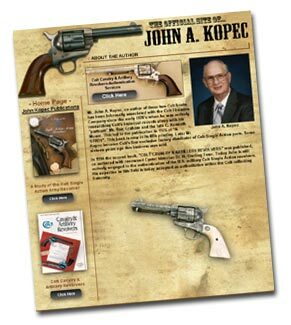 For the collector of the Colt Single Action Army, a reference library with one of the books co-authored by John A. Kopec is a must. The book “A Study of the Colt Single Action Army” is now republished in a 30-year anniversary edition. John Kopec has also entered cyberspace with his new web site www.johnakopec.com . John is still actively engaged in the authentication of the U.S. military Colt Single Action revolvers. His expertise in this field is today accepted as authoritative within the Colt collecting fraternity. You can order his books and also learn more about his Colt Cavalry & Artillery Revolver Authentication Service. just got 2 BP Colt revolvers. supposed to find info and possible sell for my Godfather’s estate.